Strangest fact: The brothers weren’t always reclusive hoarders. Both attended Columbia University, with Homer studying maritime law, and Langley studying engineering and chemistry, while also playing concert piano well enough to have performed at Carnegie Hall. When their mother died in 1929, they inherited her Harlem brownstone and lived there together. Homer practiced law, Langley sold pianos, and both taught Sunday School. The pair routinely socialized in and outside of the brownstone. Biggest controversy: We hear that Wikipedia is “riddled with inaccuracies” far, far more often than we encounter any, but there’s a strange discrepancy on the Collyer page. The brothers claimed their ancestors arrived in America on the Speedwell, “the ship that arrived in Massachusetts a week after the Mayflower in 1620.” Problem is, the Speedwell never made it to America. While the Speedwell page merely says the ship transported Pilgrims along with the Mayflower, the two ships launched together, but the Speedwell began taking on water, and after a few failed attempts at repair, passengers from both ships crowded onto the Mayflower for its historic voyage. The leaky ship was sold and eventually repaired successfully by its new owners, but it’s not clear that it ever landed in the New World, with or without any Collyer ancestors on board. Thing we were happiest to learn: Langley did his best to care for his brother, even if his methods were unconventional. He told a reporter that he fed and bathed his brother, read to him, and played the piano. He also attempted to cure Homer’s blindness with a diet of black bread, peanut butter, and one hundred oranges a week. Langley also felt the need to protect Homer. As the Collyers became well-known as shut-ins, the brownstone often drew crowds, including teenagers who would throw rocks at their windows. Rumors also abounded that the brothers were hiding vast sums of money, and were staying in the house to protect it. After several robbery attempts, Langley constructed traps and tunnels around the house, which was also starting to fill up with accumulated junk. He once claimed he was saving newspapers, “so that when [Homer] regains his sight, he can catch up on the news.” When Langley caught neighbors trying to look into their windows, he bought the neighbor’s house and let it sit empty to insure his privacy. Thing we were unhappiest to learn: Things quickly deteriorated for the shut-ins. Langley would go outside only after midnight, and for reasons unexplained, would walk all over the city for groceries, also garbage-picking food to bring back to his brother. He filled the house with found objects he picked up in his walks around the city. Meanwhile, the brownstone fell into disrepair, as it filled up with accumulated detritus. The utilities were shut off for nonpayment in 1928, and Langley’s solution was to generate electricity with a car engine, and fetch water from a pump in a nearby park. Meanwhile, no one had seen Homer Collyer in years. In 1947, an anonymous tipster called the police about the smell of a dead body coming from the Collyer brownstone. The doors were locked, and so blocked up with junk they were barely more useful open than closed. It took seven men hauling junk out to the street before anyone could get inside. 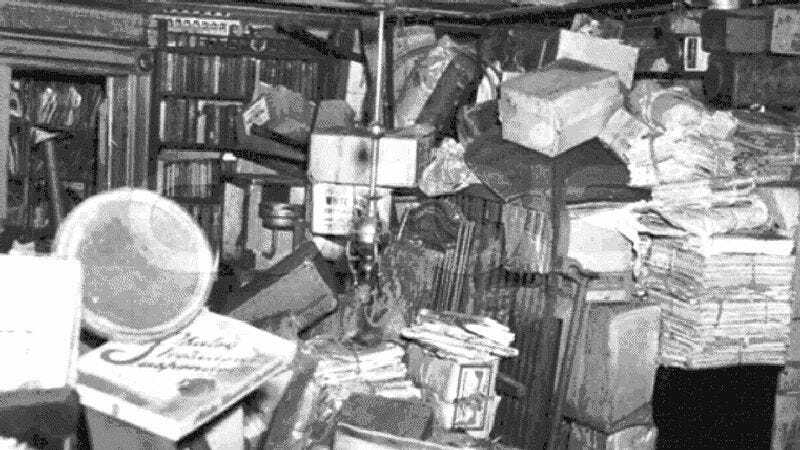 After five hours of excavating the brothers’ hoard, Homer Collyer was found dead, surrounded by boxes and newspapers piled to the ceiling. He had apparently died from starvation and heart disease. The police waited for Langley to arrive at home, but he never did. Rumors began that he had left for Atlantic City, but a manhunt along the Jersey shore was fruitless, although people called in sightings from nine states. In the meantime, the police continued to clear out the house, and 18 days after getting a tip about a dead body, a workman found Langley Collyer’s body only 10 feet from where his brother’s body had lain. His body was wedged into a two-foot-wide tunnel between a bureau, rusty bed springs, bundles of newspaper, and three metal bread boxes. The medical examiner determined he had been dead for a month. The prevalent theory is that he tripped one of his own booby traps, was crushed to death by debris, and his brother starved to death without Langley’s help. Also noteworthy: The end results of the Collyers’ hoarding weighed in at either 120 or 140 tons, depending on whether you believe the top of the Wikipedia page or the middle. In either case, it was a dizzying array of material, although nearly all of it was worthless. The hoard included baby carriages, a child’s chair (neither brother had married or had any kids), bicycles, guns, chandeliers, the top of a horse-drawn carriage, a sawhorse, dressmaking dummies, more than 25,000 books, human organs in jars (their father had been a doctor, so these may be less sinister than they at first appear), hundreds of yards of fabric, countless musical instruments, thousands of bottles and cans, and the chassis of a Model T. (for an even longer list, consult the Wiki page). Despite the fact that neither of them had worked in decades, the brothers had 34 bank accounts, with over $35,000 in 2016 dollars. But counting property, jewelry, and investments, the brothers ended up with a net worth of over $1 million in today’s money. Fifty-six distant relatives came out of the woodwork to claim their share; the courts split the estate between 23 of them. The brownstone was in such disrepair, it was torn down a few months after its owners’ deaths. Further down the wormhole: The Collyer page also links to other famous recluses, including the Beales, the mother and daughter featured in the documentary Grey Gardens; Hetty Green, who inherited a great deal of money, invested it wisely and became even richer, but was nonetheless a famous miser who supposedly only washed the dirtiest parts of her clothes to save money on soap; and Alexander Kennedy Miller, who hoarded Stutz automobiles. Stutz made cars from 1911 to 1935, one of which set a world record in 1927 by averaging a blazing speed of 68 mph over the course of a 24-hour race. While the Stutz name was revived in the 1970s, the company is still associated with cars from the beginning of the automobile era. One famous Stutz driver is Springfield’s oldest and richest man, Charles Montgomery Burns, who once claimed his Stutz Bearcat was, “the first car to outrun a man!” Given his advanced age, Burns’ most common running joke is his love of the severely outdated, as in the classic Simpsons episode “Homer At The Bat,” when he instructs Smithers to recruit players from the dead-ball era. In this period, generally considered 1900-19, home runs were a rarity, and baseball was a lower-scoring, more strategic game. This came to an end with the success of Babe Ruth and other power hitters. But we’ll look at that quieter era of the national pastime next week.